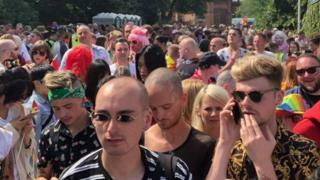 The Pride Glasgow event has been hit by ticketing problems after the event reached capacity on Saturday afternoon. People who had valid tickets and wristbands were being denied entrance, leaving hundreds of people queuing outside the oversold event at Kelvingrove Park. Following the earlier parade many arrived to join a queue to convert their tickets into bands. But they were informed by stewards that the event was full. On Saturday morning Nicola Sturgeon led a parade at Scotland's largest LGBT event. The SNP leader became the first serving prime or first minister in the UK to lead a Pride event when she opened proceedings at Pride Glasgow. The march made its way from Clyde Place to Kelvingrove Park through the city centre. The organisers had initiated a system whereby e-tickets, bought online, had to be converted into wristbands at the box office of the event — which was closed. Posts on the Pride Facebook page suggested no one was being permitted entrance regardless of the form of ticket or wristband they possessed. This included VIP tickets sold at a higher tariff. Facebook users said those stuck outside the event were warned a one-out-one-in policy may see a wait of several hours to gain entrance. Many posted asking for information about refunds. Kenneth Macleod from Paisley said: "We have tickets but you need to convert them into wristbands. It's chaos. "It's full to capacity apparently. Though we have a ticket, they are saying people with tickets aren't getting in. There is going to be a riot." Paul Rossi from Glasgow was confused about the system: "How can they sell tickets for entry then say you can't get in? "I can understand if you showed up hoping to get a ticket on the day - but not if you bought in advance." Another follower, James Pines wrote: "Are you serious? I brought a group of six LGBT teenagers and prepaid their tickets with charity money. We have to send them home soon. Will refunds be available? "We've already had one pass out and the rest are nearing it because we've run out of water. We've already waited 2 hours." On the event's official Facebook page, a status read: "At the moment the event has reached its capacity and we are unable to let anyone else in. "Enjoy the sunshine and visit the band stand where we have fantastic and free entertainment. We will update here shortly. Happy Pride!" The BBC has approached the organisers for comment.